Are you ready? No, like are you really ready? Christmas is just around the corner, meaning it’s that time to make your house festive. If you’re adventurous and don’t mind a huge energy bill, you can be one of the houses that go all out this year. Maybe recreate Malcolm Butler’s Super Bowl winning interception, or Santa landing on your roof with a full array of reindeer. Or, if you are not prepared to spend the time and effort, there are many easier and cost effective displays. Here are a few of our favorites. It is hard to give precise Christmas decorating advice to everyone, since everyone has a different front yard. However, most people have a walkway and/or driveway leading to their house, and this can be a great spot for some lights. String some lights around the edges of your walkway to provide a nice balance for your lawn and should naturally fit with your front yard. This can easily be done if you have shrubbery or trees along your walkway, or to those without this natural advantage, by adding walkway trees (a type of Christmas light) to the walkway. It also illuminates the walkway in the dark as an added bonus. Icicle lights convey falling snow, which is the perfect way to get your yard ready for the holiday season. These lights are an easy way to decorate your house without expending too much energy. Net lights are 4’ by 6’ rectangular lights that are netted by their wires. These lights usually come in colorful themes and have both incandescent and light LED bulbs. They can easily be draped over bushes and add to the overall mystique and beauty of any arrangement. This is the first legitimate standalone item on our list, but they are not hard to locate or install. Light trees are pretty self-explanatory, they are fake trees that can have different color lights that come together to put on a beautiful light display. A tree of lights is a perfect fit for most yards, regardless of the overall theme. Everyone likes a nice message, and Christmas lights give you the opportunity to make one. You can keep it simple with a “Merry Christmas,” “Happy Holidays,” or “Happy New Year,” if you want, or make it as complex as you want. We would recommend refraining from political statements, but they are your lights so do with them as you wish! Those are a few suggestions for a simple, yet attractive set up this holiday season. Remember, holiday lights are not always as simple as they seem. If you want something more in depth, or just need help setting up the lights in general, contact the experts at Greener Horizon. 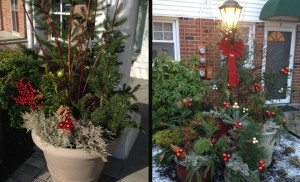 We love installing seasonal displays, and can make your yard a Christmas masterpiece. It’s a good way to enjoy the holiday’s without the headache.